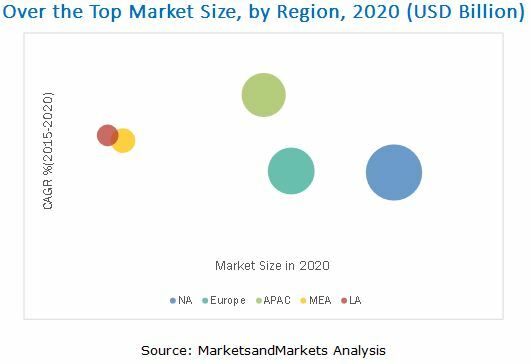 [177 Pages Report] The global Over The Top market size is expected to grow from USD 28.04 Million in 2015 to USD 62.03 Billion by 2022, at a Compound Annual Growth Rate (CAGR) of 17.2% from 2015 to 2020. The base year considered for the study is 2014 and the forecast period is 2015–2020. The objectives of the report are to define, describe, and forecast the OTT market size on the basis of content type, platform, revenue model, deployment models, service type, user-type, vertical, and region; provide detailed information regarding key factors influencing the market growth (drivers, restraints, opportunities, and challenges); track and analyze the over the top market scenario on the basis of technological developments, product launches, and mergers & acquisitions; and forecast the market size of segments with respect to five main regions: North America, Europe, Asia Pacific (APAC), Middle East and Africa (MEA), and Latin America. This research study involves extensive usage of secondary sources, directories, and databases (such as D&B Hoovers, Bloomberg, Businessweek, and Factiva) to identify and collect information useful for this technical, market-oriented, and commercial aspect of the OTT market size. The OTT market ecosystem comprises key vendors, Microsoft, Google, Facebook, Netflix, Yahoo, Apple, Akamai Technologies, Limelight Networks, Tencent Holdings, and Nimbuzz. 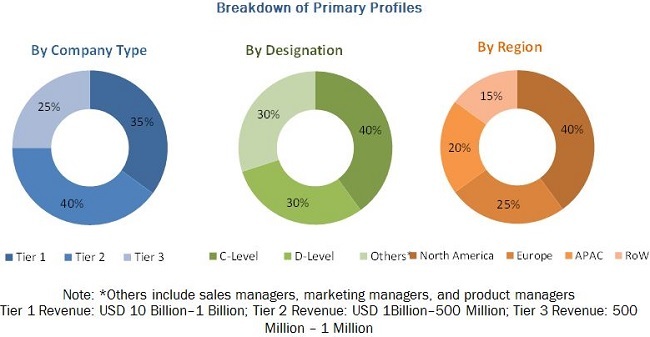 The over the top market report is broadly segmented into the following content type, platform, revenue model, deployment models, service type, user-type, vertical, and region. Presently, on-premise based deployment of Over the Top has the larger share than the cloud-based deployment of OTT, but the latter deployment model is expected to surpass during the forecast period due to high adoption rate of cloud technologies. The Small Office Home Office (SOHO), large enterprises, and Small and Medium Enterprises (SMEs) are showing high interest in the cloud-based Over the Top platforms due to its multiple advantages such as low operational expense, easy deployment, scalability, and easy collaboration. Moreover, due to the rise in mobile workforce and number of smartphone users, major players aim at providing handy and easily accessible platforms. The ongoing globalization of companies and the continuous rise in content among users have led them to enable the consolidation of content category wise through a single point provided through Over the Top platform. Likewise, with the increasing complexity pertaining to maintaining and managing this content, organizations are widely considering cloud-based deployments for implementing the central repository. North America is expected to have the largest market share and would dominate the OTT market from 2015 to 2020. Asia-pacific (APAC) offers potential growth opportunities, as companies in the APAC region are turning toward Over the Top platform providers to offer a high degree of services in terms of quality, performance, and capacity.